BMW M4 convertible rental in Miami is a great way to experience Ocean Drive. When you rent a BMW with Luxury Car Rental USA you are driving a high-performance sports car. The M4 is a popular rental car due to its beautiful styling and performance oriented engine. 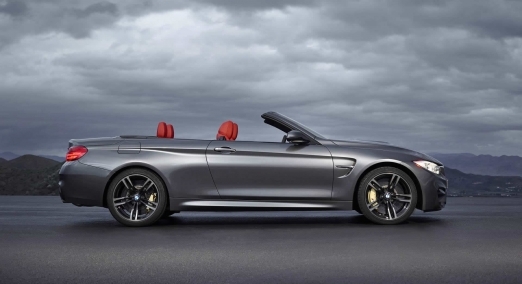 The best thing about the M4 convertible is that it can be converted from a coupe to a convertible in a matter of seconds. Out of all the Miami BMW rentals, this is one of the most exciting sports cars to drive. Brace yourself for an unforgettable car rental experience with the turbocharged M4. The legendary M series badge takes an already stylish BMW and takes it to another level. This is one of our customer’s favorite open-top M performance driving experiences. Under the hood of this BMW rental is the most prominent feature in this hard top convertible the engine. The twin-turbo inline-six engine roars as soon as you step on the gas. The BMW M4 rental is equipped with a high-pressure, lag-free turbocharge system with twin turbos and BMW’s double-VANOS technology which varies camshaft timing to allows higher pressure buildup for extreme power output even at low rpm. Combined with a 7-speed dual-clutch transmission the paddle shifters allow you to instantaneous shift with a gentle click. Rent a BMW M4 today in Miami and you won’t regret it! IF the M4 is not your cup of tea then we do offer more BMW sports cars in Miami like the i8, 428i, or 228i. 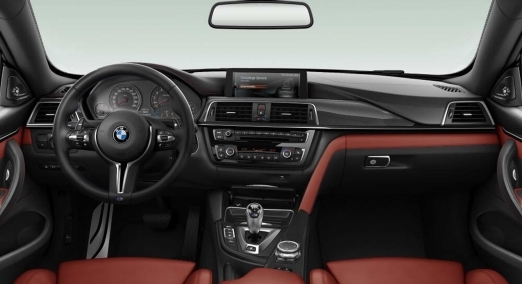 The interior of the BMW M4 is also oriented for performance and comfort. The racing style bucket seats hug your sides like a glove and are equipped with a 10-way power adjustment for a precise fit. When you unlock the car at night the seats have a backlit M Logo that glows proudly on the seat. The M4 is geared toward car enthusiast and isn’t as flashy as some of the other exotic car rentals in Miami like the i8. Step inside our M4 rental and you’ll be impressed with the technology inside like the heads-up display that shows a variety of information to enhance your driving experience. Inside you will also find the Sport and Sport+ modes which allow you to tune the car’s performance to your desired driving preference. The cost to rent a BMW M4 in Miami is around $495 per day but can vary based on the time of the year or during special events like Art Basel, Memorial Day, and Labor Day to name a few. We offer BMW M4 rentals for a day, weekly or monthly. Get this BMW delivered and picked up for free at Miami International Airport or your Miami Beach hotel upon request. We can also arrange delivery to other parts of Florida including Palm Beach, Orlando and Tampa. We would be happy to be part of your next event. Surprise your family or significant other with a BMW Rental in Miami for a birthday, prom, wedding, corporate event or as a special gift.